Craig has served the First Presbyterian Church of Naples with energy and joy since October 2015. A native of Washington, D.C., he is a graduate of the University of North Carolina at Chapel Hill, Boston College Law School and Columbia Theological Seminary. Craig practiced law in both Washington, DC and in Atlanta, Georgia. Since 1996 he has been engaged in full time ministry, first with the First Presbyterian Church of Atlanta where he served as Associate Pastor for Administration/ Executive Director until 2013 and then with Trinity Presbyterian Church in Atlanta as Senior Associate Pastor until 2015. Craig served the Presbytery of Greater Atlanta as chair of the Conflict Management team and as Moderator of the Presbytery’s Permanent Judicial Commission. Here in the Peace River Presbytery, he serves as Co-chair of the Steering Committee. Craig is married to Andie Evans Goodrich. They just celebrated their 40th anniversary and are the parents of three young adult children and grandparents of five. Rex began serving the First Presbyterian Church of Naples in July of this year. 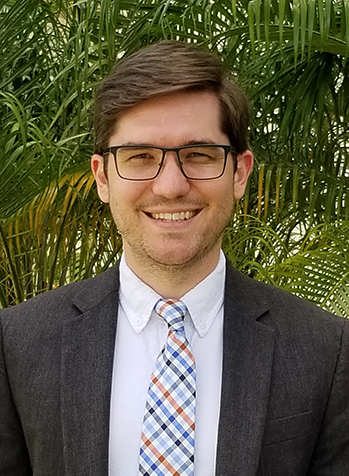 A native of Naples, FL, Rex received his undergraduate degree from the University of Florida before attending Union Presbyterian Seminary where he completed a dual-degree program, earning both Master of Divinity and Master of Arts in Christian Education degrees. This is Rex’s first call to a church and he is looking forward to working in the areas of Christian Education, pastoral care, and Mission in addition to helping lead worship. Rex has been married to Cayla Childs, who is also a Naples native, for almost three years and they love spending time with the many members of their extended family here in Naples. When not at the church or spending time with family, Rex likes to watch sports, particularly soccer, or get out on one of the many golf courses Naples has to offer. Brice was appointed Director of Music Ministries at First Presbyterian Church in 2001. A native of La Jolla, California, Brice received his bachelor's and master's degrees in organ performance from the Eastman School of Music and Indiana University respectively. He received his doctorate in choral conducting from Indiana University. In addition to his duties at First Presbyterian Church, Brice is the assistant director and accompanist of the Naples Philharmonic Choruses. He is also Adjunct Faculty at Ave Maria University in Organ Performance and Conducting and directs the Ave Maria University Chamber Choir. He and his wife, Michele, have a fifteen year old son, Colin, who is the joy of their lives. 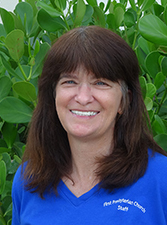 Nancy has most recently served as the Director of Children and Youth Ministries at Naples United Church of Christ. She comes to us with over ten years of experience working with children, youth and their families and has a proven track record of building programs from the ground up. She is a nationally respected Christian Educator, having served on committees dedicated to child and youth development while also helping to co-write curriculum used for a national youth event in 2016. Ashley hails from North Carolina and graduated from UNC Greensboro with a Bachelor’s degree and from East Carolina University with a Master’s degree in Child Development. She has worked in the Early Childhood arena since 1995 as a Preschool teacher, program quality specialist, state licensing consultant, program manager and Director. Ashley and her husband, Scott, live in Estero and have a son, Seth, and a dog, Gyp. Ashley and her family have been members of the church since 2005 and enjoy boating, fishing and college football! Anna hails from Pennsylvania and moved to Naples in 2004. She received her B.S. degree in Accounting and her Masters of Taxation from Villanova University. Anna has experience in the areas of accounting, audit and tax. She has served small, medium and large businesses over a wide range of industries. Anna has three children Natalie, Rex and Wyatt and a yellow lab, Nellie. She enjoys all things outdoors including bicycling and paddle-boarding. Originally from Tallahassee, FL. Ashley moved to Naples with her family in 2015. Next year she and her husband, Chris, will celebrate 15 years of marriage. They have 3 amazing children; Caitlin, Devan and Declan. Their spare time is spent reading, watching movies and going to Disney World as much as possible. Ashley has worked with children for almost 10 years and joined the FPCN family in January of 2017 as the Nursery Care Provider. She is very excited to move into her new role in the CE department and be a part of the growing CE programs! Kathleen considers herself a true "Jersey Girl" even though she moved to Naples over 25 years ago. She attended Rowan University where she majored English Literature and Business. Kathleen began working at First Presbyterian Church in 2002, after also serving us in the mid-1990’s. She holds certifications in desktop publishing and Photoshop. She and her husband Bill have been married for 20 years and she is the proud step-mom of two grown children and four grandchildren. When Kathleen is not working she can be found tending her butterfly garden, reading, quilting, cruise vacations and playing with her dogs Shelby and Autumn. Her latest hobby is researchng her family ancestry which traces back to the Mayflower. Kristen was born and raised in Naples, FL, and began working in the business office at a local skilled nursing facility while working on a Business Administration degree. After falling in love with the residents and wanting to care for them, she completed nursing school, and worked as a licensed practical nurse for 10 years. Kristen has recently felt the need to help others in a different capacity, and pursued a new career with First Presbyterian Church. In her spare time, Kristen enjoys spending time with her family, which includes her partner, Michael, their son, Eli, two dogs and two cats, gardening, reading, and being outside in nature. Sharman Pfaus is a native of Michigan, having moved to Naples in 1999. She has functioned in several roles of the church from Youth Director, Administrative Assistant, Administrator, and most recently as the Executive Office Manager for First Presbyterian Church Naples. Sharman holds two nationally recognized certifications in human resources, the first with the Human Resources Certification Institute (HRCI) and the Society for Human Resources Management (SHRM) and has been a member of the HR Collier Chapter of SHRM since 2003. In her spare time, Sharman enjoys spending time watching sunsets on the beach, playing with her granddaughters and reading. She is married to Bill and they have four grown daughters, all of whom live in the SW Florida area. Liz recently celebrated her five year work anniversary at First Presbyteiran Church, although her connection with the church goes back to the 1990's. She was a member of the Youth Group, she and her husband, Brian, were married here, and her two children, Ian (9) and Leah (7) were baptized here. As the Administrative Assistant, her job varies from administrative tasks and accounting, to fixing boo-boos and checking temperatures! Sandy is our longest serving staff member and began working here in 1981. Originally from New Jersey, she moved here as a teenager, when Naples was a much smaller town. She and her husband, Eugene have been married for 40 years and have two grown children Jennifer and Dustin. Sandy enjoys spending time with her twin granddaughters, Ashleigh and Alyssa. She loves supporting her favorite football team, the Miami Dolphins, cruising the Caribbean and chocolate! Lisa joined the First Presbyterian staff in April 2018. Originally from Buffalo, NY, she moved to Naples in 1984. Lisa has a daughter, Ashley. She enjoys spending time with her mother and watching NFL football. She also loves watching movies and going for walks. 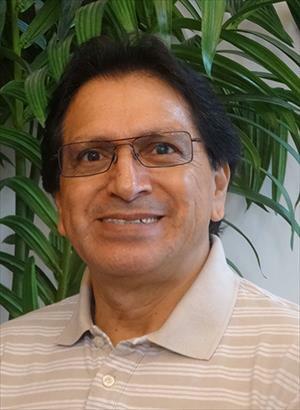 Eduardo joined our staff in June 2018. Originally from Ecuador, he came to the United States in 1998. He has been married to his wife, Monica, for 39 years. They have two grown children, Evelyn and Edison, and a 7 year old granddaughter, Sophia. He enjoys spending time with his family, watching movies with his granddaughter, basketball and soccer.